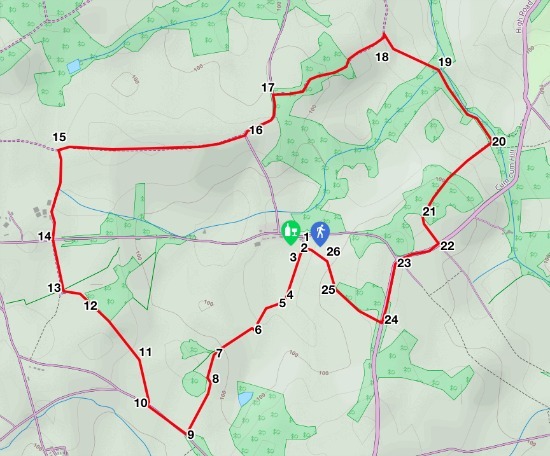 A pleasant circular walk from The Woodman, Wildhill car park over fields, along a ridge, through woodland and back to the pub. This route is a combination of two shorter walks on this site, Walk 2: The Camfield Place Loop, and Walk 6: The Wildhill Loop. If you intend to end this walk with a drink at the Woodman in Wildhill you can park in the pub car park. When in the pub car park you will see that the parking area splits. The lower area, just beyond a few out-buildings, leads to a gate in the south-west corner (Hatfield footpath 84). Take this footpath. As you look beyond this gate you will see another a small wooden bridge and then another gate almost straight ahead. Note: This field is often very muddy and churned up by horses so tread carefully. Go through this second gate and head almost straight ahead but slightly diagonally to the right. To help with navigation, head in the direction of the Brookmans Park transmitter on the distant horizon. The path crosses a small plank footbridge before climbing left to another gate. Note: Be careful just after crossing the footbridge because the path you want swings to the left and up to the gate, and doesn't go straight ahead along a path that's been trodden by the horses. Go through the gate and turn right, keeping to the right-hand boundary of the field with the hedge on the right. Skirt the field and follow the hedge round as it veers left. You soon reach a gap in the hedge and another post with yellow arrow, just after a small stream. The post suggests you go straight across the field, but the last time I was there it had been ploughed up, so the best route is to turn slightly right and then, keeping the boundary of the field on your right, skirt the field keeping the field on your left and the hedgerow and ditch on your right and continue slightly uphill as the path climbs to the woods ahead. Depending on the season, the path sometimes heads diagonally to the left, through the crops towards a beech tree at the edge of the wood. Alternatively, you can continue skirting the boundary of the field keeping the field on your left and the hedgerow, ditch, and woods on your right, until you come to the corner of the woods. Here you can walk through a gap in the boundary of the field and continue walking with the woodland on your right. At this point you will see the Brookmans Park transmitter to the south. Look back for excellent views over to Wildhill and Essendon. Keep walking, heading to a point slightly to the right of the distant transmitter mast until you reach a gate and broken gate leading out to Grubbs Lane. Turn right here and walk single file and against the traffic for less than a tenth of a mile. Soon after you past Westfield Lodge, look out for a footpath sign on the right (Hatfield footpath 82) pointing through the hedgerow and leading into a field. Cross the fields walking diagonally left as the path goes through the crops heading to the left of the pylon and under the power lines. The path then continues diagonally left through another field of crops heading towards the woods and a wooden post with yellow arrow. Keeping the woods on your right, continue straight along the footpath. At the end of the woodland, another wooden post with yellow arrow points the way ahead. Continue along the footpath. Here the footpath bends slightly to the left and then the right (Hatfield footpath 81). Continue following the footpath north. This track eventually comes to a T-junction, here you turn right and follow the tree-lined path (Hatfield BOAT 80) as it heads east. This BOAT (byway open to all traffic) finally reaches West End Lane. Here you turn left and follow the lane as it heads east and then north. Soon after the bend, look out for a signpost on the right for Hatfield BOAT 14 to Essendon. Take this byway and head east. After about half a mile the path bends to the left and there is a metal gate on the right alongside a sign post. 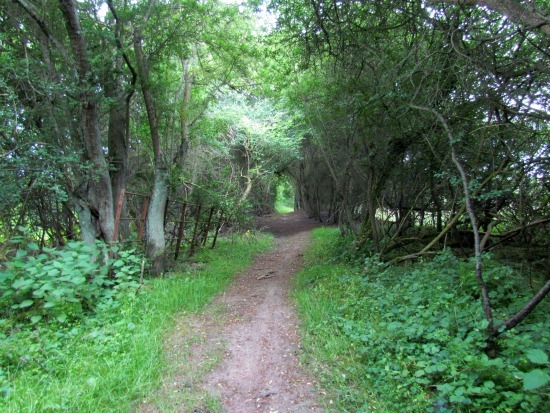 Take this path (Essendon footpath 16) and head east with the hedgerow on your left and the field on your right. This path dips down to a small wooden footbridge as it enters the woodland. Cross the bridge and continue. The path eventually reaches a footpath junction with a path to the left, one going straight on, and a path to the right. You turn right here along Essendon footpath 15. Continue uphill until you reach the woodland soon after an open space with fields on either side. Continue through the woods until you see some farm buildings on your left. Here you turn left. Walk past some cottages on your left and you will arrive on the B158, Kentish Lane. Here you turn right. Walk along the footpath alongside the B158 until you reach the junction with Wildhill Road. Continue along Kentish Lane (at some point you need to cross Kentish Lane in order to continue walking along the footpath on the east side of the road). Continue past the first house on the left looking out for a footpath on your right and a gap in the hedge. Cross Kentish Lane and take this path (Hatfield footpath 85) heading west. The path crosses a field and then skirts woodland with the hedge on your right and the field on your left. Go through a gate, across another field heading for a gap in the hedge. Continue through the next gate and drop down the hill to The Woodman car park.